For the very first time in six months, drug overdoses have declined in Manchester, New Hampshire. Officials say it's thanks to a new program called "Safe Station," which allows people struggling with addiction to walk into any fire station across the city and get help. Safe Station takes advantage of the critical moment when someone decides they want help. To meet Leah Szarek is to understand the success of the program fully. Szarek tried to hold back tears as she talked to necn Friday about what life was like before last Sunday. "You've disappointed everybody, you've lied, cheated, and stole," she said. Szarek was addicted to heroin. A police officer told her about Safe Station a few weeks ago. It allowed Szarek to walk into any fire station in the city and get the help she finally wanted. "I just knew I couldn't do it on my own anymore, and when I walked in, they make you feel like you're welcome, like you're making the right choice," Szarek said. Since Safe Station launched on May 4, more than 100 people have taken advantage of it. 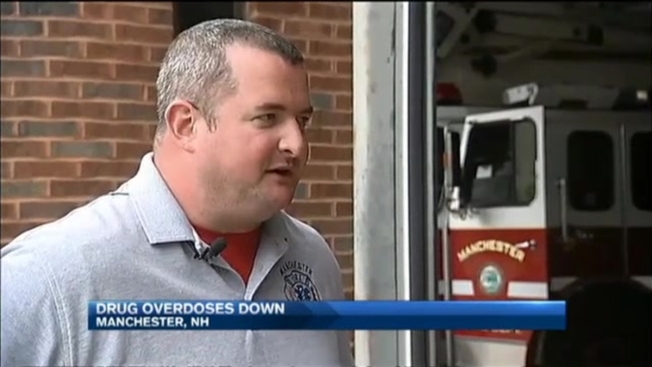 "It's humbling and overwhelming at the same time," said Manchester EMS Officer Chris Hickey. The program was really his idea. "What we have given them is 10 doors across the city that are open 24/7 where we can get them set up with what they need," Hickey said Friday. Once someone walks into a fire station, they're immediately assessed by paramedics, and if they don't have to go to the hospital, they will get a recovery coach on the spot. They're brought to Hope for New Hampshire where they're connected to long-term recovery options. "Being able to respond right when someone wants help, that's where the magic happens," said Hope for New Hampshire volunteer Melissa Crews. Szarec is now putting addiction behind her. "I am happy in the morning, every day is better than the next," she said. And it's all because inside a Manchester fire station, she found that self-respect she says she lost along the way. "Being treated like you're somebody instead of nobody, it's important to start rebuilding, I think that's key," Szarek said. In the month of May, since the program started, there have been 20 fewer overdoses than in April. Still, firefighters say they're responding to several overdose calls every single day.